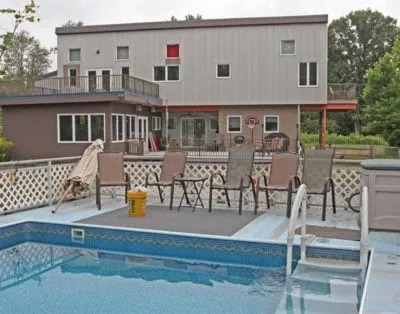 Buckleys Drydock offers a modern, multilevel, executive-style house with room for entertaining plenty of friends and family, or just enjoy the quiet time for a small gathering. You will find a gourmet kitchen featuring an open-concept living room, dining room, and kitchen with an open vaulted 21-foot wood ceiling and partial views of Lake Erie. 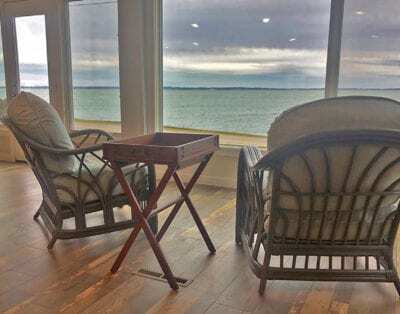 Watch the sunsets on Lake Erie from your private second and third floor balconies. The second floor is the perfect place for entertaining with its large decks, both in the front and the back. The large deck on the front of the house faces Lake Erie and an equally large deck in the back faces the fire pit and a private wooded area. 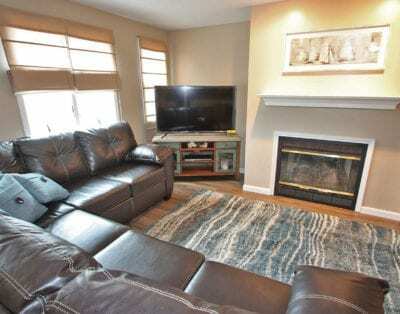 For days when the weather prevents outside exploration and fun, the family room features a home theater. And, the large recreation room in the basement features a wet bar, shuffle board table, pool table, and large screen 42-inch TV and a walkout covered patio. If you simply cannot leave work behind, the home is equipped with wireless internet service. There are four bedrooms and 4 full bathrooms. In addition, there is a room that can used as an extra bedroom or a quiet place to work. Both bedrooms on the second floor (main level) have doors leading to the back deck, where you can enjoy family meals, a bon fire, morning coffee, or even a late-night drink. The master bathroom has a six-foot whirlpool jet tub with a wall mounted TV in the attached Romanesque style bathroom. We invite you to spend your next island getaway nestled off the beaten path at Buckleys Drydock!. Cancellation Policy: Full refund for cancellations made within 48 hours of booking if the check-in date is at least 14 days away. 50% refund for cancellations made at least 14 days before check-in. No refunds for cancellations made within 14 days of check-in.